Very many good things taste even better with bacon. 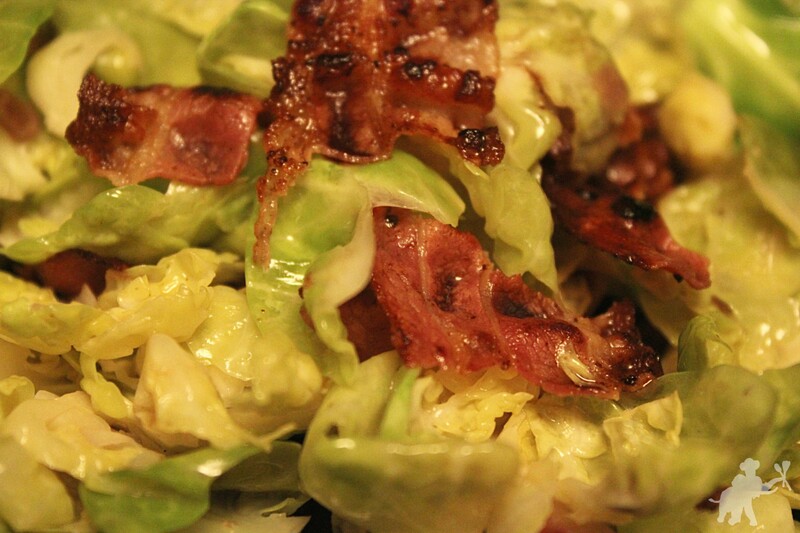 In fact, I think it is pretty much everything, including Brussels sprouts. Proof: see below! First, prepare the Brussels sprouts. Cut the stems off and remove the outer leaves. Separate the leaves. The very small leaves in the center are almost inseparable, so don’t bother and just cut them in slices. Put the bacon in a large skillet and cook over medium-high heat until the bacon is crisp. Transfer the bacon to a paper towel and cover with another paper towel to soak up excess fat. Turn the heat down to medium. Melt the butter in the same skillet. Add onion and garlic and let brown for about 1 minute while stirring, then deglaze with balsamic vinegar. 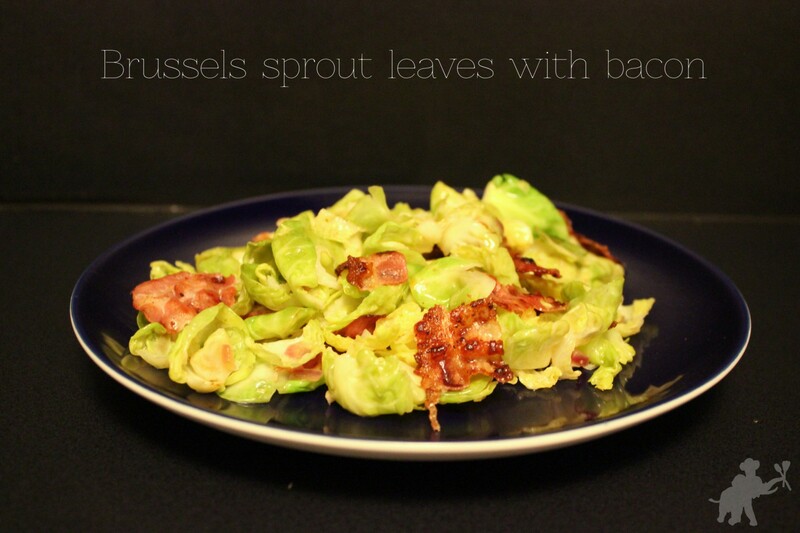 Add the Brussels sprout leaves, toss. Let them brown just slightly, stirring occasionally. Don’t let it wilt too much. 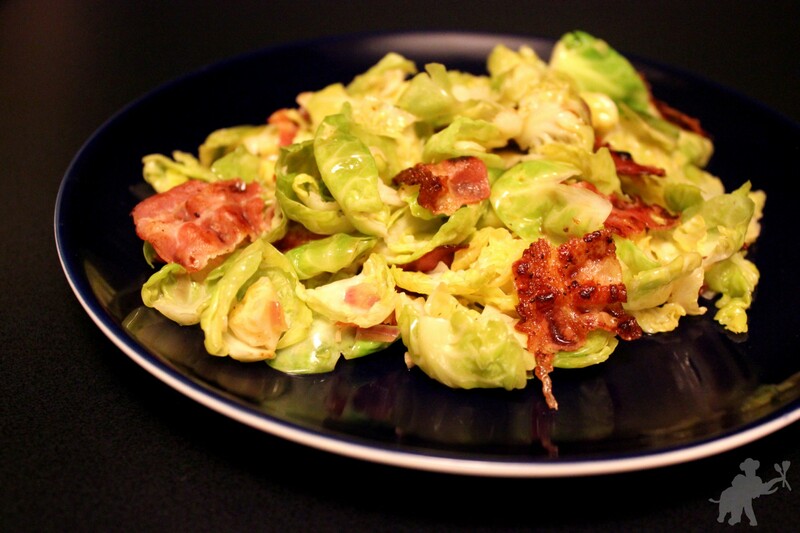 Cut the bacon into pieces and mix with the Brussels sprouts. Remove the skillet from the heat, add the bacon and season with salt and pepper. Serve immediately.